Or, get it for 19200 Kobo Super Points! The work that follows the capture of a photographic image - the workflow in the digital darkroom - has a significant effect on the quality of the final image. This workflow is often underestimated and neglected, leading to weak images and poorly managed image collections. The Digital Photography Workflow Handbook will help you avoid crucial mistakes as you master the craft of photographic post-processing. This book provides a step-by-step guide through the photographic workflow, from image capture, editing, and asset management, all the way to the perfect photographic print. The workflow presented in this book focuses on RAW images, which will give you maximum quality and flexibility, and is based on two of the most popular and powerful software tools: Adobe Photoshop and Lightroom. 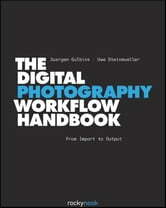 The Digital Photography Workflow Handbook can be used as a reference of textbook by both aspiring amateur and professional photographers, as well as by students.